When a friend of mine first took me to a local Vietnamese eatery back in Springfield, Missouri a few years ago, I was a little bit skeptical to say the least. 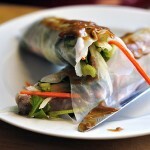 I had no idea what Vietnamese food tasted like, or even a clue what ingredients and tastes were popular in that region. Feeling a bit ignorant, I feared the worst. My friend recommended a bowl of Pho, a Vietnamese soup he said, and I was surprised when it was brought out and placed in front of me. It was like nothing I’d ever seen or had before. Waves of fresh fragrance and taste invaded all of my senses from ingredients I’d never thought to pair or even try in my own cooking. How could clear broth and slippery noodles be so good? I’ve been hooked on Vietnamese food ever since. Soon after my first bowl of Pho, I decided to try Bun (pronounced “boon”). Often described as a “rice salad,” this is a great meal if you want to be full, but feel great knowing you just had a bowl full of fresh veggies, aeromatic herbs, and light rice noodles all in a sweet and spicy Nuoc Cham (recipe below) fish sauce! Don’t be intimidated. It’s super simple you’ll fall in love on the first bite. This recipe is from a great blog, Chaos in the Kitchen, and I found it to be the most “newbie friendly” way to make this. 2. 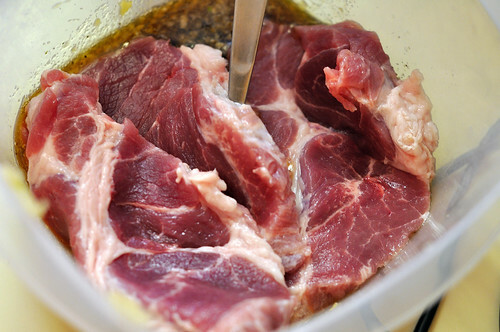 While the pork is marinating, slice lettuce into thin strips. Julienne the carrots and cucumbers, and have the herbs washed and ready. 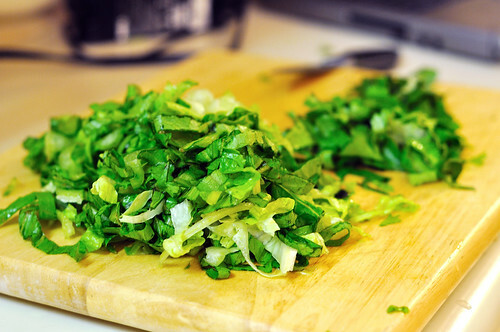 Place into separate bowls after chopping and store in the fridge to keep cool and fresh. 3. When your meat if finished marinating, grill the pork until somewhat blackened. Because we made this on a weeknight and it was already dark, we opted to prepare ours in the oven. Note: We did ours in the oven because of lack of daylight, however I highly recommend using a gas or charcoal grilling method. 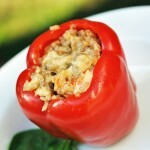 If you opt to use the oven, cook at 375 degrees for 15 minutes, then broil each side for 5-10 additional minutes. 4. Once pork is cooked, remove from heat and set aside to cool. 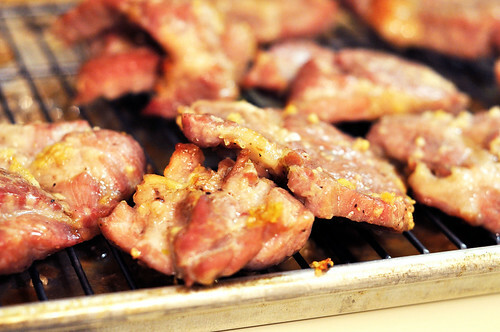 Slice pork into thin strips after cooled. 5. Bring a large bowl of water to boil. Place uncooked Vermicelli noodles into a separate bowl of warm water for about 6 minutes and then transfer to the pot of boiling water. Allow noodles to cook in the boiling water for 3-4 minutes. Watch carefully, as 3-4 minutes goes by fast. The noodles should be firm yet very flexible. 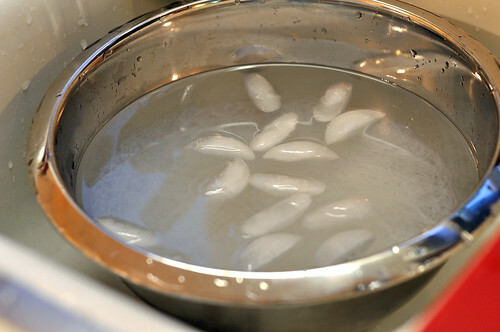 Strain and place cooked noodles in a bowl of cold or iced water to quickly stop the cooking process. 6. 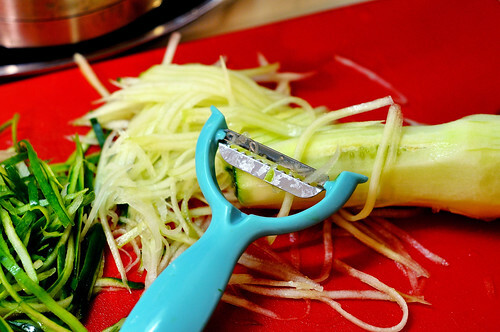 Make your Nuoc Cham. 1. Combine all ingredients into a bowl and mix well. Refrigerate to keep cool. Note: this can last a few days, so if you can make more or less if you want to have this for multiple days. 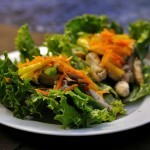 Place shredded lettuce in the bottom of a large dinner bowl. Add the cooled noodles, then in a wreath around the rim of the bowl, add cucumber, carrots, cilantro, basil, ans sprouts. Place pork in the middle. 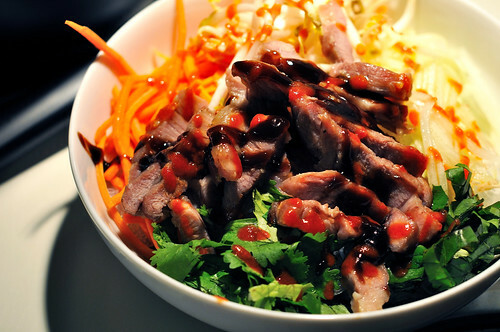 We recommend putting some Hoisin Sauce on the pork, and if you like things spicy put some Sriracha Sauce as well. Lastly, pour ½ to 1 cup of the Nuoc Cham over the entire bowl, lightly mix the bowl up to mix in flavors. 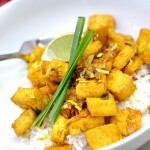 It’s one of mine and Jessica’s favorite dishes, and since we don’t have a good Vietnamese restaurant in town (yet! ), making it tides us over between visits to our favorite place and trying out new ones. If you’re vegetarian, you don’t have to miss out! 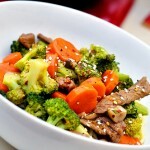 Replace the fish sauce with soy sauce and use Jessica’s favorite substitution: sliced veggie egg rolls or tofu. We also love it with grilled shrimp. It’s delicious! When you took me to that restuarant it was a little overwhelming so I get what you are saying. This looks really delicious though! On the foodnetwork show “Great Food Truck Race” there was a Vietnamese truck that served really great vietnamese sandwiches. Maybe something to try out next? Woo that is a good idea! You’re referring to Banh Mi, and to me they are like Vietnamese “Po’ Boys” lol. This looks absolutely delicious! 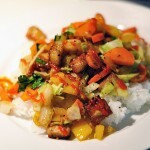 It kind of reminds me of one of my favorites – Vietnamese Bimbimbap. Yum.